Navigate: StoreFront / Cross Stitch Patterns By Designer / MarNic Designs / MarNic Designs - When I Am Old... I Will Celebrate More! 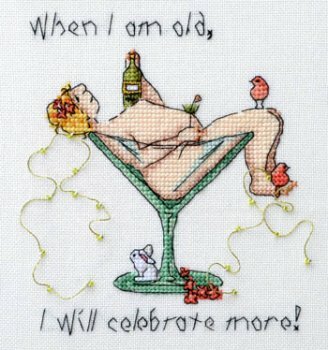 MarNic Designs - When I Am Old... I Will Celebrate More! -The model is stitched on 28ct antique white Jobelan fabric. -The stitch count is 65w x 71h.